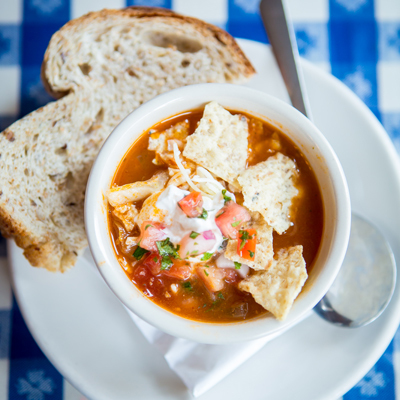 Made fresh each day, so you never know what culinary splendor awaits you. 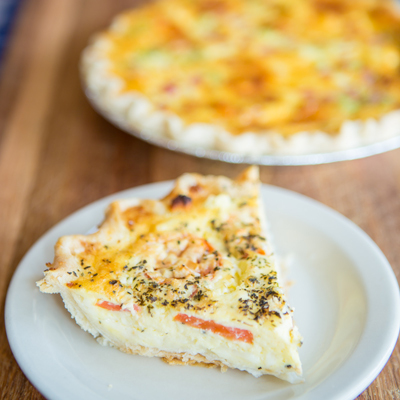 Our handmade pie shell filled with savory meats, vegetables and cheese. Our chicken salad served on a bed of lettuce with frozen fruit salad and buttered Raisin Bread. A sampler plate of our chicken salad, tuna salad and egg salad with frozen fruit salad and buttered Raisin Bread. Delicious ham and cheddar filling wrapped in homemade bread dough and baked fresh daily. Delicious spinach and feta filling wrapped in homemade bread dough and baked fresh daily. Delicious turkey and honey dijon filling wrapped in homemade bread dough and baked fresh daily. Our most popular sandwich! Made daily with premium chicken tenders, celery, and Hellman’s mayonnaise. A wonderful variation of our chicken salad, made with curry, red grapes and chopped pecans. Premium white albacore tuna, cream cheese, onions, sweet red peppers and Hellman’s mayonnaise. Hand-chopped eggs, relish, celery and Hellman’s mayonnaise. Fresh grated white cheddar, pimentos, relish and Hellman’s mayonnaise. Ham or Turkey, American cheese, lettuce, tomato, spicy mustard and mayo served on French bread. 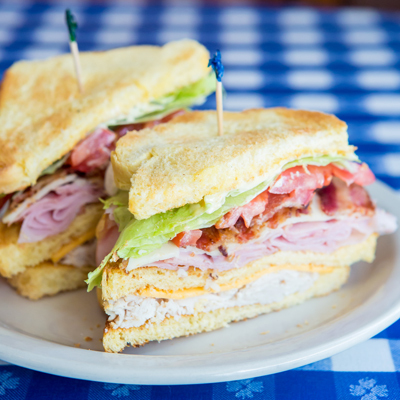 Turkey, bacon, lettuce, tomato and mayo served on your choice of bread. Available hot or cold. Chocolate Chess Pecan, Blackberry, Apple Streusel, Rhubarb, Blueberry, Chess, Chocolate Meringue, Pecan, Peach, Cherry and occasionally, a Cream Pie. Little Viking (8 oz.) – Small & Mighty!